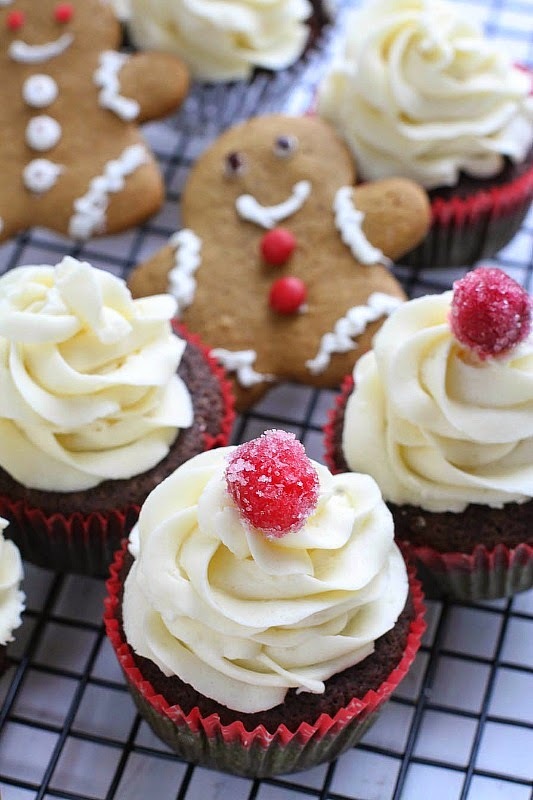 Light, airy and moist gluten free chocolate gingerbread cupcakes with a gluten free gingerbread cookie crust and topped with creamy, fluffy white chocolate frosting. Cupcakes were the first things I ever baked from scratch for my husband. I can still remember his reaction when he took that very first bite. It was a hesitant and forced smile. Sadly for me, that batch quickly made its way to the garbage. Even though my baking has improved over the years, we had to start all over again when I began venturing into baking with gluten free products for my beloved niece and sister-in-law who are both sensitive to gluten. I have also been incorporating more gluten free foods for myself ever since having my daughter earlier this year. One of my niece’s favorite treats she misses the most since going gluten free are light, airy and moist chocolate cupcakes. Over the years, there have been hits and misses with my experiments using various gluten free flours and flour blends — a lot of them either end up dry and tough or gummy and heavy. 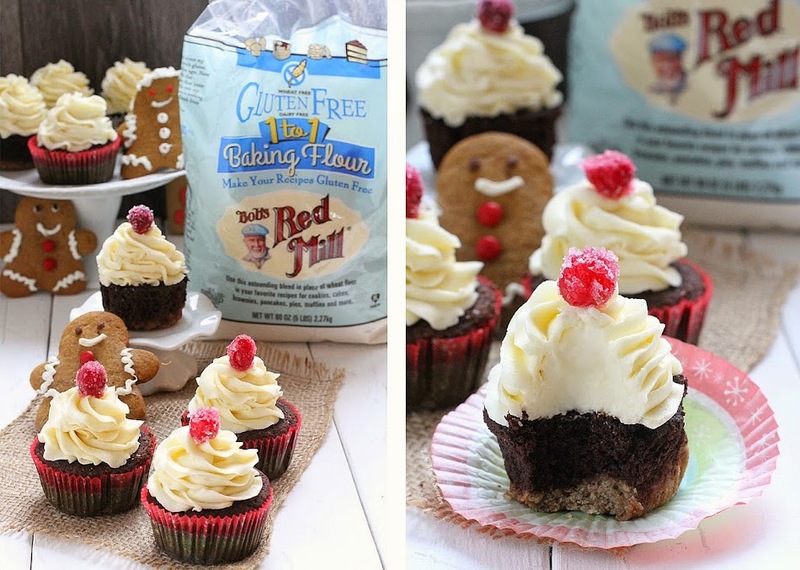 So when I was given the opportunity to try Bob’s Red Mill Gluten Free 1-to-1 Baking Flour and incorporate it into my holiday baking, I was really intrigued as to how well it would work to replace the all purpose flour in our favorite regular chocolate cupcake recipe. This flour is supposed to be perfectly formulated for baked goods with no additional specialty ingredients or custom recipes required. After experimenting with it in a few recipes, I was very pleased with how well it worked in these Chocolate Gingerbread Cupcakes. It combines finely ground brown rice flour, sweet white rice flour, whole grain sorghum flour, potato starch, and tapioca flour with a touch of xanthan gum which was just enough to create a springy cupcake. 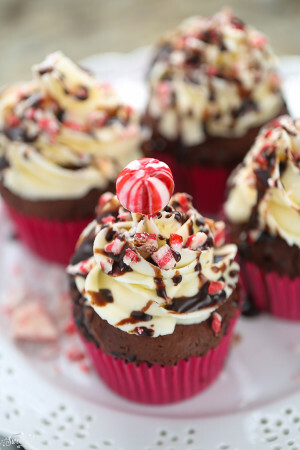 These turned out to be everything that my niece could have asked for in a holiday version of her favorite chocolate cupcakes. I added warm gingerbread spices and molasses to the chocolate cupcake batter and layered that over a crumbled gluten free gingerbread cookie crust that was also made with the gluten free flour blend. 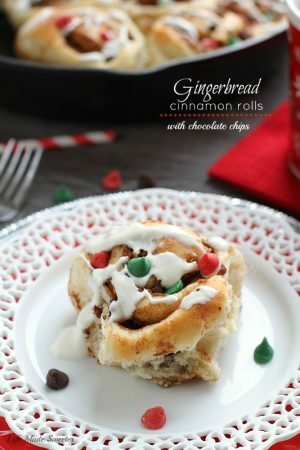 After popping that together in the oven, they came out fluffy and moist and the chocolate and gingerbread flavors tied together wonderfully along with the zippy cookie crust. The rich, creamy white chocolate frosting is an excellent match to the strong flavors of gingerbread and adds a sweet festive combo to the sugared cranberry garnish. My husband could not tell they were gluten free and told me that these were his favorite holiday cupcakes I’ve made so far — and that’s saying a lot because he’s tried all of my cupcakes throughout the years. I can’t begin to tell you how excited I am to experiment with more of my favorite recipes using this flour blend from Bob’s Red Mill. 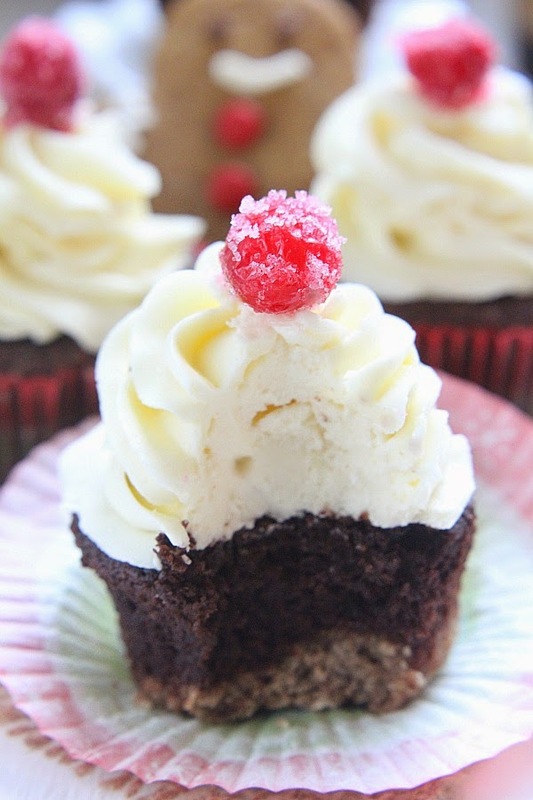 If you are still looking for a tasty gluten free holiday cupcake to add to your Christmas dessert table, I really hope you’ll give these a try! 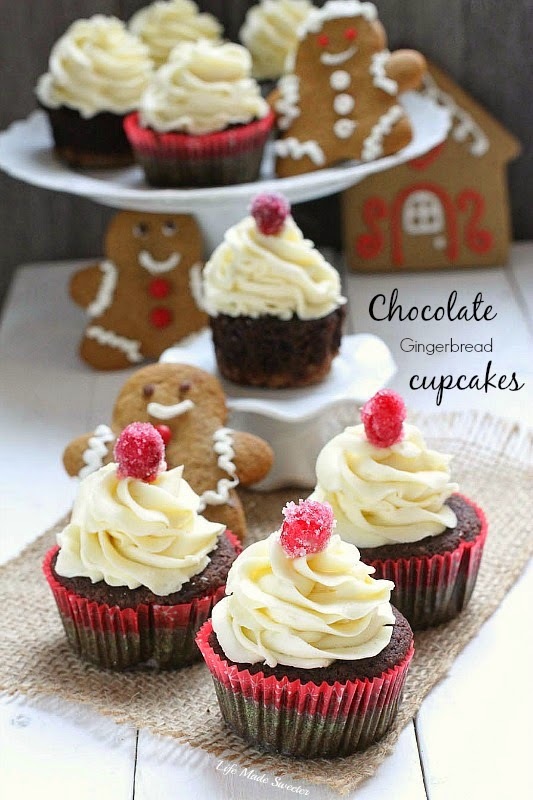 Light, airy and moist gluten free chocolate gingerbread cupcakes with a gluten free gingerbread cookie crust. Topped with a fluffy white chocolate frosting, it's the perfect combination for the holidays! Preheat the oven to 300 F degrees. Line muffin tin with cupcake liners. Combine crushed gingerbread cookies and melted butter together in a bowl. Scoop 2 tablespoons and divide among the prepared cupcake liners. Push down using the bottom of a small glass cup. Set aside. Add hot water to a large mug or cup, slowly sprinkle in chocolate chips and allow to melt. Stir occasionally until fully melted. In a large bowl, whisk together the flour, sugar, cocoa powder, baking powder, baking soda, cinnamon, ginger, cloves, nutmeg and salt. Set aside. In another large bowl or in the bowl of a stand mixer, beat eggs for about 3 minutes until thickened slightly and lemon colored. Slowly add in the oil, vanilla extract, buttermilk, molasses, apple sauce and melted chocolate mixture - beating until combined well. Slowly add the flour mixture in quarters and blend until each addition is incorporated. Scrape down the sides of the bowl and blend again just until that is all incorporated. Be careful not to overmix or that will produce a harder texture. Mixture will be thick. Scoop or pour batter filling liners 2/3 full. Be careful not to overfill as they will rise. Bake for about 25-30 minutes or until toothpick inserted comes out clean.. Do not open the oven door until at least 22 minutes otherwise the middle will cave. While cupcakes are baking, prepare frosting below. When cupcakes are finished baking, remove from oven and keep them in the muffin tins for about 10 minutes before transferring to wire racks to continue cooling. Frost when they are completely cool. Make the white chocolate buttercream frosting: In a medium bowl using a handheld or stand mixer fitted with a paddle attachment, beat the butter on medium speed for 1 minute. Switch the mixer to low speed and slowly add the powdered sugar. Quickly stir the cooled white chocolate so that it is smooth and add to the butter/sugar mixture. Switch the mixer to medium speed and beat for 2 minutes until combined and creamy. Add the vanilla extract, and salt. Beat for another minute until combined. Add 1 tablespoon at a time of heavy cream until consistency is desired. Frost the cupcakes and top with candied cranberries or sprinkles if desired. Disclosure: This post is sponsored by Bob’s Red Mill. All thoughts and opinions are 100% my own. Thank you for supporting the brands that keep me inspired.